This patient presented with a loose skin fold over her upper lid and wrinkled skin under the lower lid. These attributes can add years to a persons appearance and can be quite distracting. 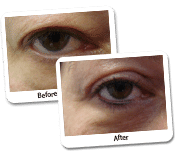 The patient underwent an upper and lower Blepharoplasty and lower lid Erbium resurfacing. This procedure has literally opened this patients eyes. The patient now has a defined upper lid crease and the excess skin is no longer hanging. The lower lid is now smooth and the fine lines have been dramatically improved. Eyelid surgery, also known under the name blepharoplasty, is a surgical procedure where excess skin and fat are removed from the upper and/or lower eyelid. The procedure can provide patients with a more youthful appearance and correct restricted view problems for patients with droopy eyelids. 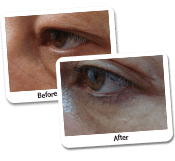 The price of eyelid surgery is variable, because not all patients need both eyelids treated. 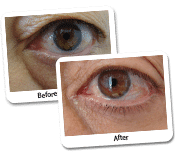 Some patients only have problems with a droopy upper eyelid, in which case the lower eyelid will not be treated. Naturally, this can affect the procedure. 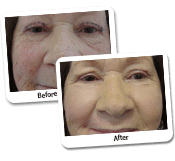 Costs for eyelid surgery can be subject to the surgeon you choose too. Prices can be different from clinic to clinic, so many patients compare prices before they choose a clinic. Dr Lanzer aims to keep all procedures as affordable as possible for his patients. Patients who want eyelid surgery can usually count on a good rate at the Dr Lanzer Clinic as well, since Dr Lanzer has his own operating theatre, enabling patients to avoid the expense of hospital fees. To get an accurate estimate for eyelid surgery, an appointment with your cosmetic surgeon is advised. When you choose the Dr Lanzer Clinic for eyelid surgery, you can take advantage of a no-obligation free appointment, where Dr Lanzer can determine your suitability for the procedure and provide you with a cost estimate. How Is Surgery on the Upper Eyelid Performed? To remove excess skin, fat, or muscle from the upper eyelid, the surgeon will make an incision that runs along the crease of the eyelid; this enables patients to keep the scar from the surgery somewhat hidden. Once the incision is made, the cosmetic surgeon can remove excess tissue and skin if required. Then, the incision is closed up. 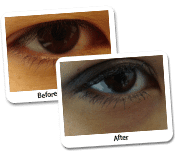 How Is Surgery on the Lower Eyelid Performed? The technique used for lower eyelid surgery can vary from surgeon to surgeon. Some surgeons, like Dr Lanzer, prefer to use the laser method; this is a procedure where a laser is used to make a tiny incision in a strategic location. 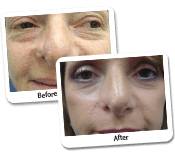 The laser is also used to vaporize skin defects such as fine lines and wrinkles, giving patients an improved result. Surgery of the lower eyelid works quite similar to that of the upper eyelid. An incision is made just below the lower lashes or on the inside of the eyelid; the latter ensures the scar stays hidden. Then, the surgeon will remove excess fat or skin as required. In some cases, some of the muscles and tendons of the lower eyelid may require additional support. 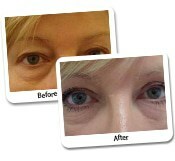 Does Eyelid Surgery Have Downtime? Most cosmetic procedures are accompanied with some downtime. No matter how minimal the downtime is post-surgery, it is always recommended to take some time off work and give the body the appropriate amount of time to heal. Please note that patients who had eyelid surgery cannot drive for several days after the procedure. Therefore, it is highly recommended to have someone drive you home after the procedure; this is also necessary since general anaesthetic is used to perform eyelid surgery. What Should I Take into Consideration During My Recovery? 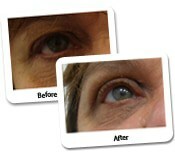 There are some things patients can do to promote the healing process after their eyelid surgery. Below, we have listed the most common things that could contribute to a faster recovery. Patients can experience some degree of swelling on the treatment area post-surgery. Therefore, it is recommended to keep the head elevated with a number of pillows for at least a couple of days; this while sleeping or resting. Elevating the head will reduce the swelling somewhat and promote the healing process overall. Of course, patients should protect their eyes against the weather elements too post-surgery. One of the best ways to do this is by wearing a pair of sunglasses. Not only does this protect the eyes against direct sunlight, it also provides some protection against the wind. Patients will receive some prescribed medication from the Dr Lanzer Clinic for pain management and infection prevention after their procedure. Please follow the instructions received by the Dr Lanzer Clinic carefully when taking your post-surgery medication. Do I Need to Avoid Anything After Eyelid Surgery? There are some things patients should avoid shortly after their procedure. One of the things to avoid is strenuous activity and swimming; this since these actions could cause complications shortly after the procedure. Patients should also refrain from smoking after their treatment. Not only can smoking cause premature ageing of the skin, it also increases the chances of post-surgery complications and slows down the healing process. Please do not wear any contact lenses for at least one week after the surgery; this since the eyes will be rather sensitive for some time. Contact lenses can be worn again once the Dr Lanzer Clinic gives the patient the all clear.